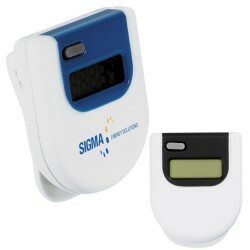 Promotional pedometers are popular outdoor advertising products. 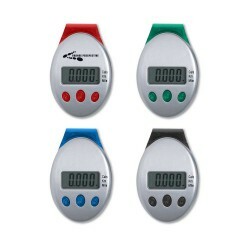 Let your customers keep track of their steps with these durable and accurate branded promo pedometers. Ideal for giving away during outdoor events such as marathons and fun runs, branded fitness products boost brand recognition by simply having your corporate, business name or logo printed on them. 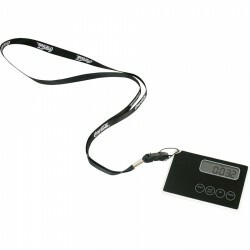 At ACE, you can choose from a generous selection of corporate branded pedometers with features that include calorie counter, stop watches, flashing lights and reflectors. 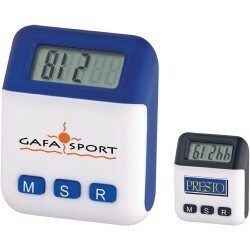 Call our sales team for a FREE quote on pedometers! 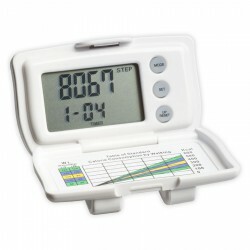 StayFit ProStep Multi-Function Pulse Pedometer Calculates estimated steps taken (up to 99,999), distance in miles, calories burned, and pulse rate. Displays time (12/24 hour mode). Stopwatch function. 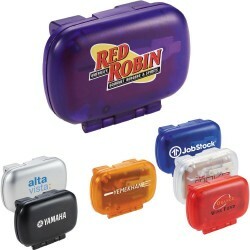 Includes 2 button cell batteries. 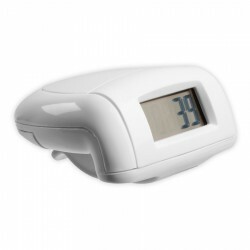 StayFit Training Pedometer Pedometer measures calories burned, steps taken (99,999), and distance traveled (miles). Belt clip attached. Includes instructions and button cell battery. Marathon Solar Pedometer Solar-powered pedometer measures calories burned, steps taken (1-99,999), and distance traveled. Stride and weight settings. Belt clip attached. Includes instructions. PEB Pedometer Small and lightweight, this multi-functional pedometer measures steps taken, calculates distance, and calories burned. Also features auto on/off to conserve power. 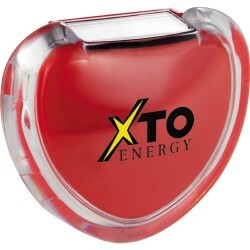 Heart Pedometer Heart shaped pedometer with clear acrylic cover is the perfect addition to any health related promotion or as a reminder of the positive effects walking can have on your health. Features step, distance and calories burned with an easy to view screen on top. Step-On! 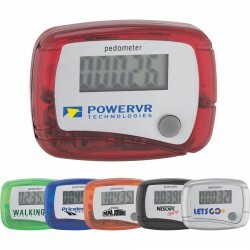 (Pedometer) Clip pedometer to belt or shoe laces and get going. Counts steps up to 99,999. Includes instruction manual and button cell battery. Exposure with every step! 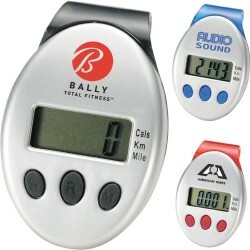 This mini pedometer measures steps, calories and distance, guaranteed to go the extra mile! Leading authorities recommend at least 30 minutes of moderate physical activity per day. 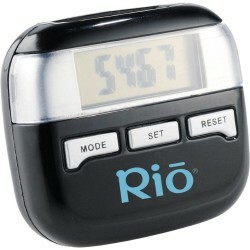 Motivate your clients and staff to improve their physical well-being with this feature-packed pedometer. 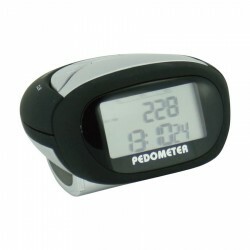 Pedometer Plus measures steps, distance, calories and also features a clock and timer. Nice design yet low cost pedometer. Includes 1 button cell. 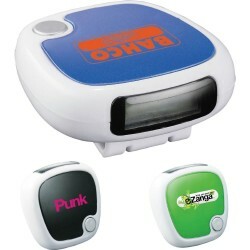 Pedometer with flashing light and reflector. Ideal for jogging or walking in the dark. Includes 3 button cells. 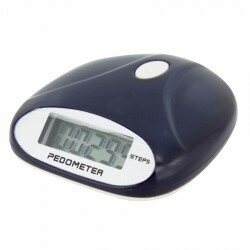 Slim and trendy pedometer with silicone bumper cover and lanyard for easy carrying and connecting. Counts steps, distance and calories. Includes 1 button cell. Measures steps, distance travelled and calorie consumption. 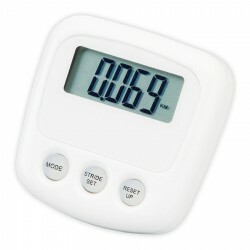 Features: Step counter (0-99,999). Distance counter (0.000-99,999km/miles). Calorie consumption from 0.0-9,999.9 Kcal. 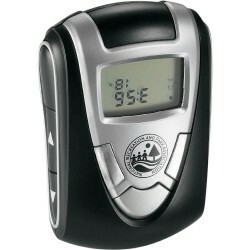 Stylish design with FM scan radio, clock, stopwatch functions. Reads steps, distance and calories in both metric and imperial. 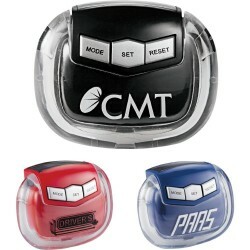 Features: FM stereo with 19 preset radio stations with 2 x AG-13 batteries included. 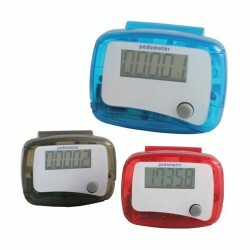 White pedometer with step measuring function, digital display and belt clip Features: Easy to use pedometer counts steps only. Large decoration area and battery included. Simple design with step counter and reset button. Batteries included. Slimline and super accurate with multi functions. Multi function with high accuracy rating. 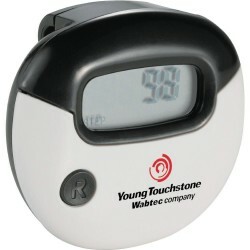 Time and step counter, distance and stop watch. 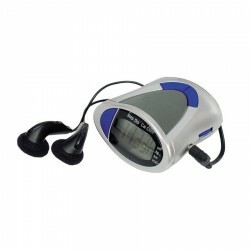 Weight, height and stride can be adjusted by user, Calories and ODO, Step accuracy adjustment, LED flashlight. Funky design with step counter, reset button and belt clip. Battery included. 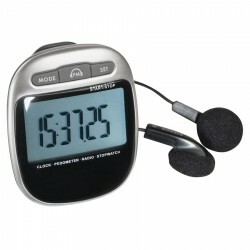 Deluxe three function pedometer which records steps, distance and calories on a large easy to read display. Features a laser tuned pendulum movement and has a secure belt clip. NOTE: A production lead time of 10-15 working days, plus shipping, applies to this product as this item is a product directly sourced from overseas.